Would you rent a room to a speculative realist? The attic garret is the traditional home of the intellectual bohemian, and has about it a certain romance. There is a justly famous and often-quoted line from G. K. Chesterton’s Heretics that goes, “…for a landlady considering a lodger, it is important to know his income, but still more important to know his philosophy.” The very next sentence is less well known, though it closely corresponds to a point I have been attempting to make in some of my recent posts more narrowly concerned with military tactics and strategy, and it is this: “We think that for a general about to fight an enemy, it is important to know the enemy’s numbers, but still more important to know the enemy’s philosophy.” (I. Introductory Remarks on the Importance of Orthodoxy) Exactly. For greatest authenticity, one's attic garret ought to be in Paris, but this isn't possible for most starving artists, unappreciated poets, and radical metaphysicians today. While I seem to agree globally with Chesterton, when descending into crucial details I cannot sustain that agreement, but Chesterton’s style is so wonderful that one can forgive him almost anything. So we will leave at that, and I will take the position of typically rude readers who, as Nietzsche wrote, “…proceed like plundering soldiers: they pick up a few things they can use, soil and confuse the rest, and blaspheme the whole.” (Mixed Opinions and Maxims, sec. 137) I fear I must plead guilty to this charge, but I plead guilty with a clear conscience, and I think Nietzsche would have appreciated that. In the spirit of Chesterton’s observation, I was wondering about whether the “new kid on the block” (philosophically speaking) should or would be let a room. By “the new kid on the block” I am thinking of the new movement in philosophy (recently discussed in my Back to shop class!) known as speculative realism or object oriented ontology (OOO). This puts a practical twist on a recent philosophical movement. I also wrote a piece called Metaphysical Responsibility in which I sketched a possible object oriented axiology, which is relevant to a discussion of the trustworthiness of a speculative realist. So, if we put ourselves in the shoes of a typically skeptical landlady (which is itself a thought experiment in ethics), we must ask ourselves this: would you rent a room to a speculative realist? Would a speculative realistic pay his or her rent in a timely manner? Would they prove to be a neat and orderly tenant, with regular habits, or would they have loud parties and be the cause of repeated and unwelcome police calls? No landlord wants their address to be a fixture on the police bulletin board, as a habitual source of trouble, so you try to rent to the “right sort” of people. These are, admittedly, painfully bourgeois values: cleanliness, neatness, orderliness, regularity of habits, responsibility, financial soundness — but they are the values that a landlord will favor, especially if the landlord and tenant live in close proximity, perhaps in the same building. The absentee landlord is more focused on the minimal exchange of “callous ‘cash payment'” (as Marx put it in the Communist Manifesto) and may be more forgiving and tolerant of the tenant’s way of life than the imagined landlady in Chesterton’s quote. Thus Bohemians who dress in an eccentric style, keep odd hours, and generally flaunt the social expectations of the day may find themselves living in converted warehouses rather than a home-style rooming house with hot meals. 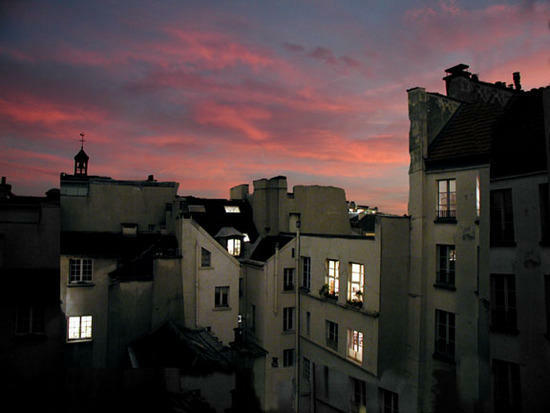 From personal experience, as well as a general appreciation of human nature and contemporary society, I can easily imagine that there are many today who would emphatically prefer the bohemian existence of rundown lodgings, even if it means living in an abandoned warehouse instead of the classic Paris garret of the starving artist or unappreciated poet. 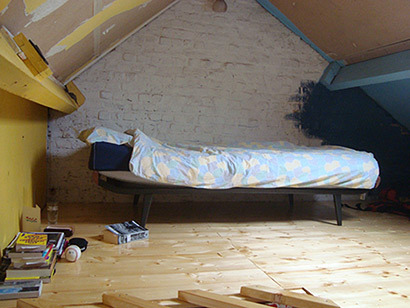 Indeed, many young people leave home precisely because they prefer the freedom of not having their movements observed by a parent or other authority figure, and find a sense of personal freedom in a bohemian community that has nothing but contempt for the cozy home of the skeptical landlady (even if they have to go home to do their laundry). For many people, the landlady’s room, which she values so highly and would not let out lightly, would be something of a nightmare return to quasi-parental supervision, with horrific visions of a parlor decorated in chintz, with the occasional Hummel figurine scattered about for decoration. For many today this is not an image of comfort, but an image to induce nausea. We must keep all of this in mind, in the fullness of the complexity and diversity of life, when we ask whether speculative realists and OOO enthusiasts are the “right kind” of people, worthy of the trust of the skeptical landlady. We must keep this in mind not least due to the fact that the speculative realist will assign something of an equal value to these diverse values, principles, and forms of life. While I am no expert on speculative realism and OOO, my understanding is that its de-coupling of Kantian correlationism in the interest of furthering the Copernican Revolution would mean that values, principles, and habits of life are themselves independent objects which might be featured in one of those wonderful litanies that the speculative realist and OOO crowd love to promulgate. It is foolish, generally speaking, for a philosopher to set fire to another philosopher in Smithfield Market because they do not agree in their theory of the universe. That was done very frequently in the last decadence of the Middle Ages, and it failed altogether in its object. But there is one thing that is infinitely more absurd and unpractical than burning a man for his philosophy. This is the habit of saying that his philosophy does not matter, and this is done universally in the twentieth century, in the decadence of the great revolutionary period. General theories are everywhere contemned; the doctrine of the Rights of Man is dismissed with the doctrine of the Fall of Man. Atheism itself is too theological for us to-day. Revolution itself is too much of a system; liberty itself is too much of a restraint. We will have no generalizations. Mr. Bernard Shaw has put the view in a perfect epigram: “The golden rule is that there is no golden rule.” We are more and more to discuss details in art, politics, literature. A man’s opinion on tramcars matters; his opinion on Botticelli matters; his opinion on all things does not matter. He may turn over and explore a million objects, but he must not find that strange object, the universe; for if he does he will have a religion, and be lost. Everything matters—except everything. Here Chesterton reveals the metaphysical counterpart of the painfully bourgeois values of the skeptical landlady: the universe is distinct from the million objects that constitute the universe, and it is only in recognizing this distinction, and then in further recognizing the universe behind the million objects, that one will have a religion. I am going to allow myself here to interpret Chesterton in a manner that, for philosophers, would be considered charitable. Since he has here used “religion” as a kind of valuation of a man’s form of being in the world — essentially as an oblique compliment, used to express vague approval — and our interest here is really in the landlady’s knowledge of her tenant’s philosophy and not his or her religion, I am going to read Chesterton such that recognizing the distinction between the million objects and the universe, and further recognizing the universe beyond the objects, means that one has a metaphysics (rather than meaning that one has a religion; we will simply leave this aside for today). From this perspective, we already have our answer: the skeptical landlady, being the thorough type, has given her prospective tenant a questionnaire to fill out detailing the philosophical positions of the applicant. If you think it is unpleasant to have to fill out the typical form for a rental unit, imagine having to reveal your novel and radical philosophical views on a form whose check boxes are governed by an narrowly conceived ontology that trades in only the most traditional concepts. Once the speculative realist returns his or her rental questionnaire, revealing that there is no universe behind the million objects, and that when objects congregate they don’t constitute a universe or a world but rather another object — one object among many objects, none of which is privileged — the skeptical landlady will at that point have to reveal in turn that there are ancient and respected covenants written into her property deed that legally gives her the right to refuse to rent to those with the wrong metaphysic. It seems that speculative realists, you see, aren’t the “right kind” of people, as implied by Chesterton’s distinction, and as we could imagine it would be interpreted by the skeptical landlady (whose bourgeois skepticism is aimed at non-traditional ontologies and curiously spares the traditional ontologies of more reliable tenants). Like the aspiring musician who once took piano lessons in the conservatory but who has since discovered the guilty pleasures of electric guitars and amplifiers and as a result is banished from the conservatory to the garage, the speculative realist must seek his domicile with the bohemians. Different kinds of people respond to different forms of respectability. These diverse forms of respectability are themselves independent objects in the non-universe of speculative realism. Like anyone else, I respond viscerally to such things as well. To tell the truth, if I had a room to rent and I learned that a prospective tenant was a Heideggerian, I might not refuse to rent the room, but I have to admit that I would be immediately suspicious. Though I don’t share the conventional outlook of the skeptical landlady, the fact of the matter is that I would nevertheless hesitate to rent a room to a Heideggerian. And we know that speculative realism and OOO are thoroughly imbued with the spirit of Heidegger, concerned as the movement is with working out the full implications of Heidegger’s readiness-to-hand. But there has been enough water under the philosophical bridge that I don’t think that I would hesitate to rent to a speculative realist, however Heideggerian the origins of his or her ideas.